Rice fields till where the eyes can see. Tiny roads, smiley people and the wind on your face. 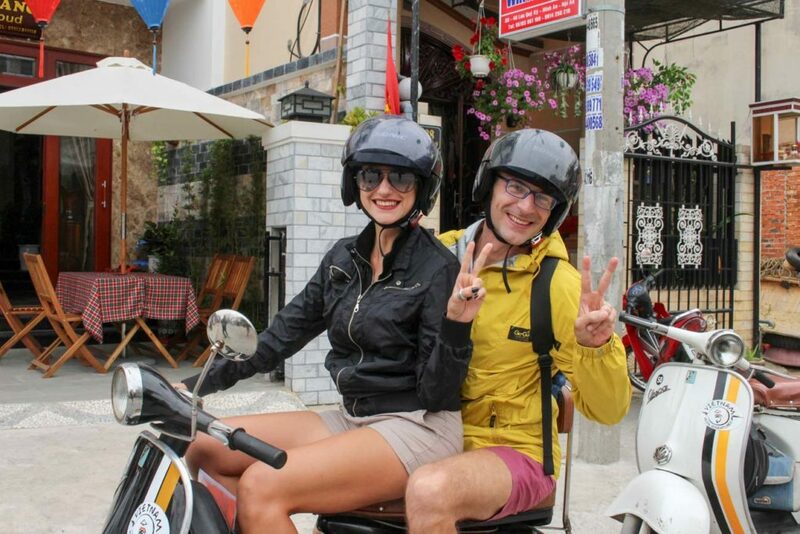 That’s how you should explore Hoi An, on the back of a vintage Vespa, beyond the old town. 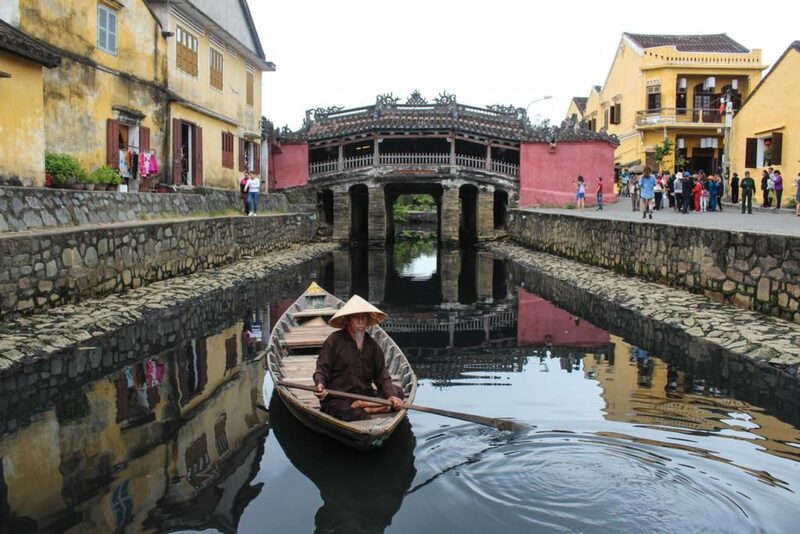 Hoi An is famous for the architecture heritage, the Chinese temples, and the lanterns, no doubt they are enchanting. 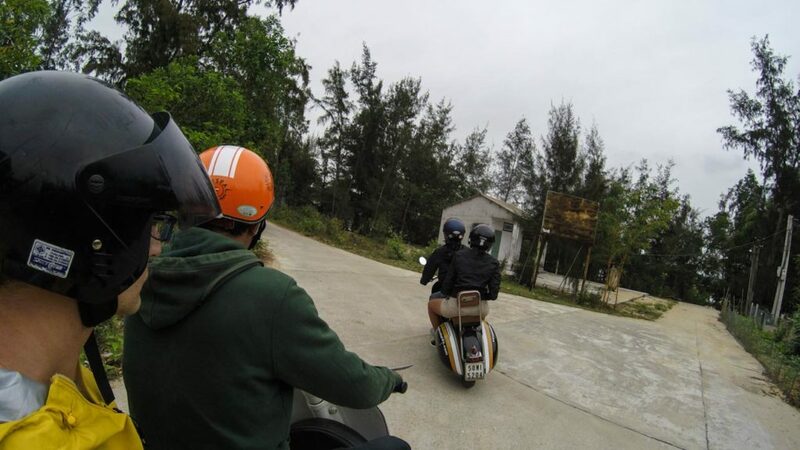 But the city has much more to offer, and the best way to discover it is doing the Hoi An Vespa Tour. Hoi An is our favourite destination in Vietnam. The ancient culture, the relaxed atmosphere, the food… Sometimes you feel like you are in a different country, not in the crazy Vietnam. The pace of life in Hoi An is different, slowly, people talk to you calmly and the traffic is normal, perfect to enjoy the Hoi An Vespa tour. 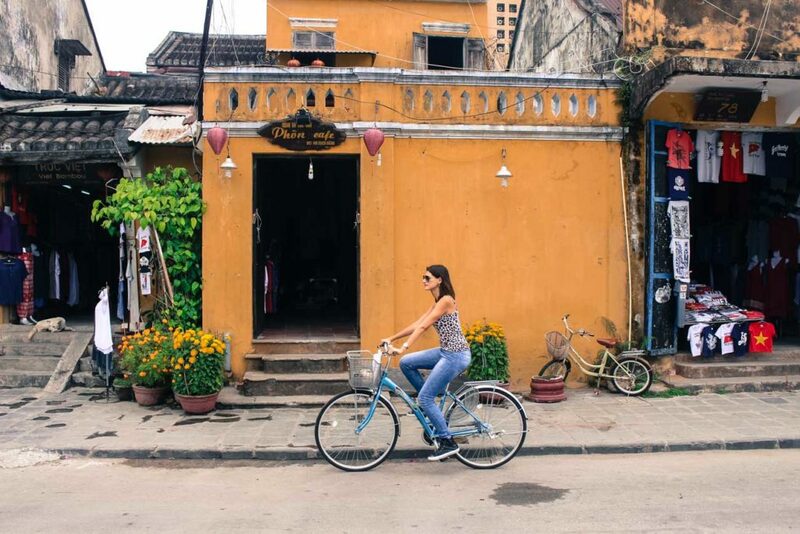 The city attracts thousand of tourists every year, and you must visit all the top attractions in Hoi An and the Unesco Heritage sites, although leave one extra day on your travel itinerary to explore the real Hoi An, the city beyond the tourist attractions. 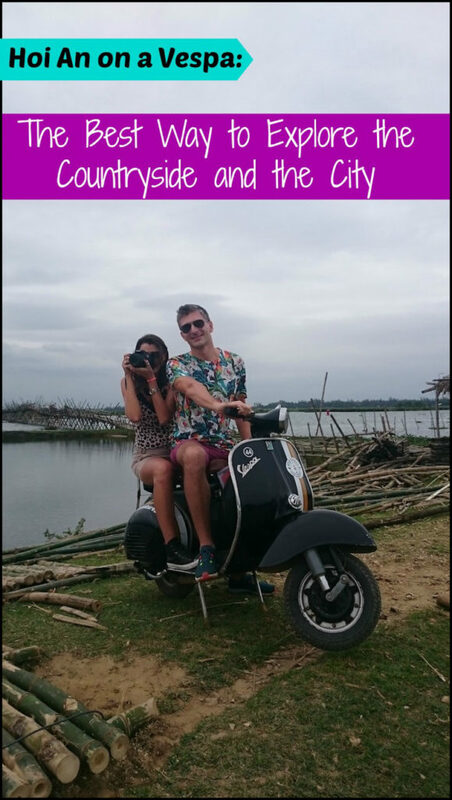 Hoi An Vespa Tour: Go Local! It was 1pm when we met Trinh, our lovely tour guide. The two vintage Vespas were waiting for us in front of the homestay, we put our helmets on and seated on the back of the Vespa. This was the first cool feature of the Hoi An Countryside Adventure by Vespa Tour, you don’t need to drive, so everybody can join and enjoy. If you followed our adventure around Vietnam [Ho Chi Minh City, Hanoi and Sapa Mountains], you already know that we are not fans of big group tours. We like to have local experiences and go on a tour that gives us a different perspective of place, an opportunity to explore a city in a unique way. That’s exactly what we got on the Hoi An Vespa Tour. 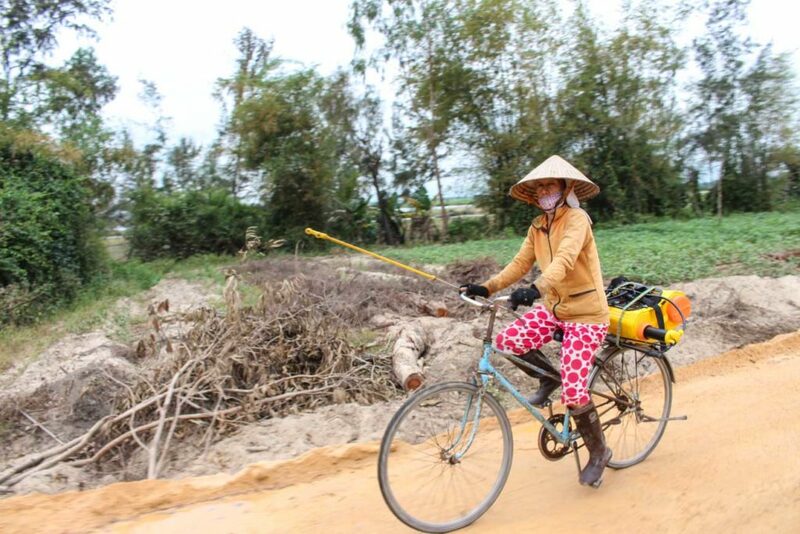 Trinh and her colleague are experienced drives, and they rode smoothly on the roads of Hoi An countryside. 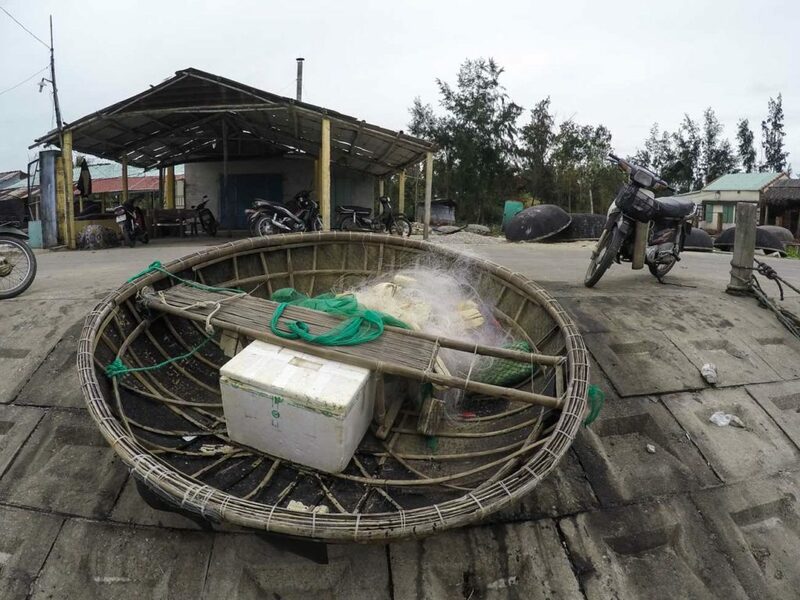 Our first stop was in a fisherman’s village, where we learned about the basket boats and visited a local fish sauce factory. We also discovered that Vietnamese from small towns are more smiley than the people from big cities. The ladies in the factory, the farmers working in the rice fields, and even the people inside the shops were waving to us, greeting us, showing happiness for having us around. Second stop was in a tiny eatery surrounded by small houses, fields, and trees. 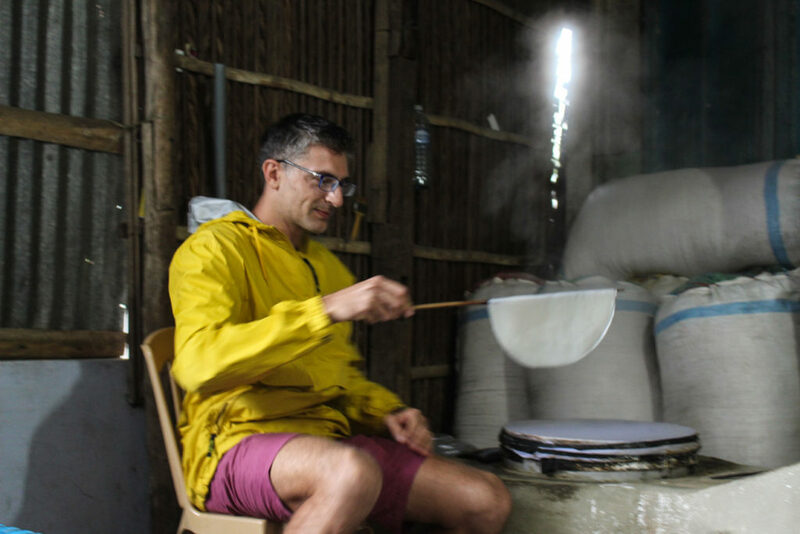 Time to try one of Vietnam’s specialities: rice pancakes. In the kitchen, the old lady mixed rice flour, beans sprout, eggs, and seasonings. The dough goes in a frying pan until it becomes golden crispy. The pancakes are served with rice paper, green salad and chili sauce. Roll everything together and eat. On the recipe you also can have pork and shrimp, but as I’m on a vegetarian diet, we tried the plain version of Bánh xèo. Sorry, no picture! We were too busy eating. Here is our first tip: if you book your Hoi An Vespa Tour for the afternoon, don’t have lunch before the tour. We ate before the tour and it was a big mistake. If I had an empty stomach I would have devoured at least three more pancakes. And don’t forget to order a local beer. The Bánh xèo goes very well with a cold beer, and as you are not driving, no problem to have a few sips during the tour. After the pancakes we got back on the road. The scenery was stunning! We drove through endless rice fields passing by fruit farms, rivers, and water buffalos. We stopped our Vespas many times waiting for ducks and chicken to cross the road. On the way to our third stop we reached the Bamboo Bridge. Huge, hanging between two islets and being repaired by the families who live there. 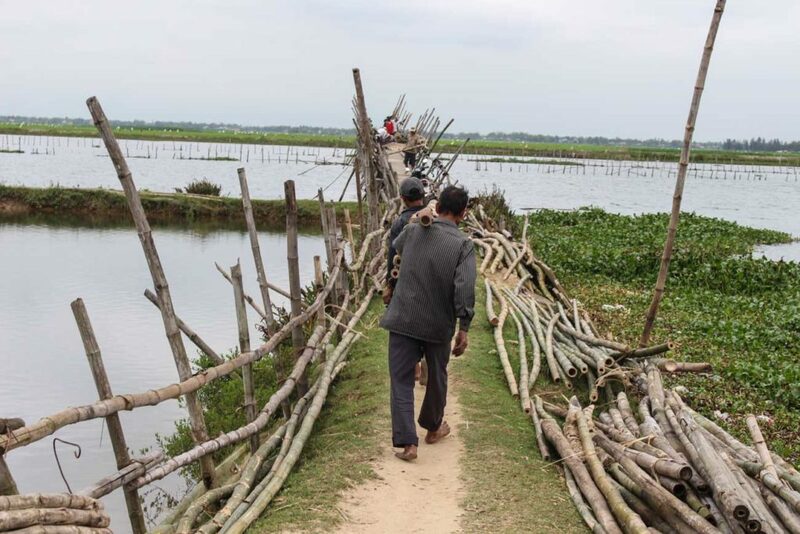 The bridge is one of the biggest bamboo bridges in Vietnam and because of the rainy and floods, it needs constant maintenance. We had to wait a few minutes, so the guys could replace the broken bamboo and make the bridge safe enough for us to cross. After the scary and beautiful bamboo bridge, it was time to relax! 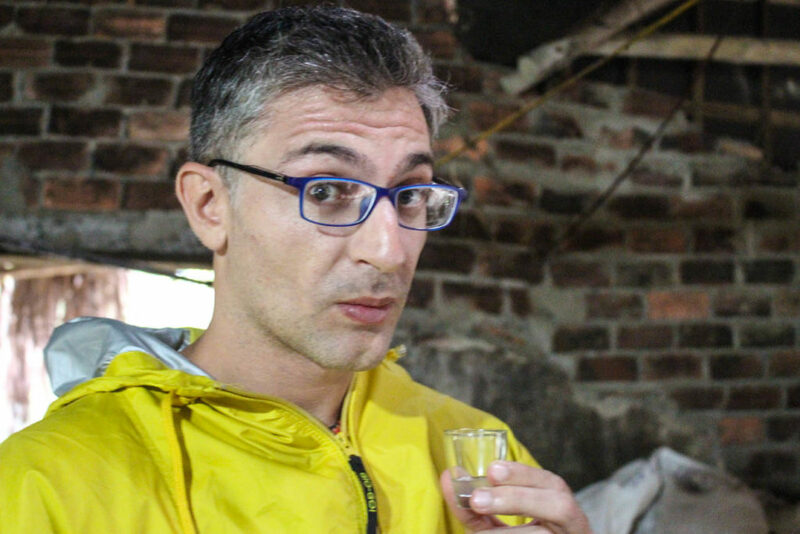 We stopped in a house to learned how to prepare and drink rice wine. Another lesson learned: the rice wine they produce in Hoi An is too strong, the lightest one is still 60% alcohol. When I drank it, I felt like a dragon spitting fire! Our Hoi An Vespa Tour kept surprising us. 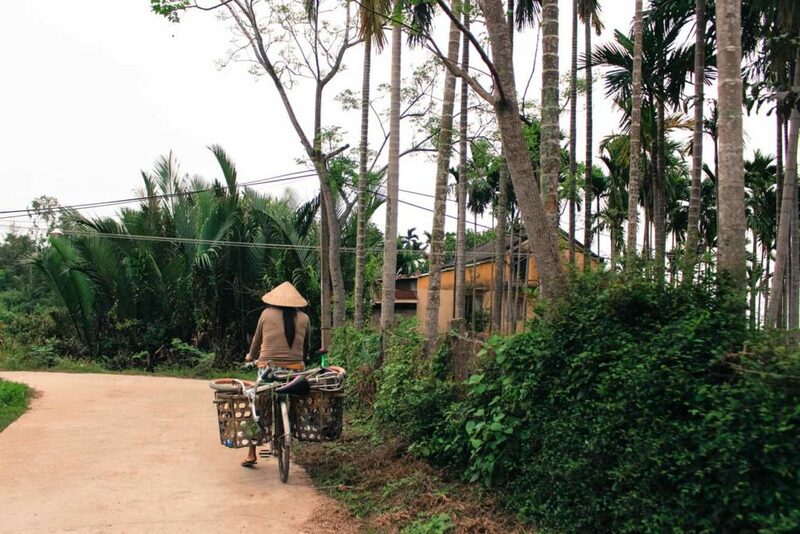 A different way to meet people, to witness the local life and understand that the countryside of Hoi An is very different from the old town and touristic areas. Around 4pm we arrived at our last stop for more delicious food. We enjoyed the whole Vespa experience, but this last visit had something special. For me, it was the highlight of the Hoi An Vespa Tour. We arrived at this simple house and we were greeted by a lovely woman, a really old man and a few kids. 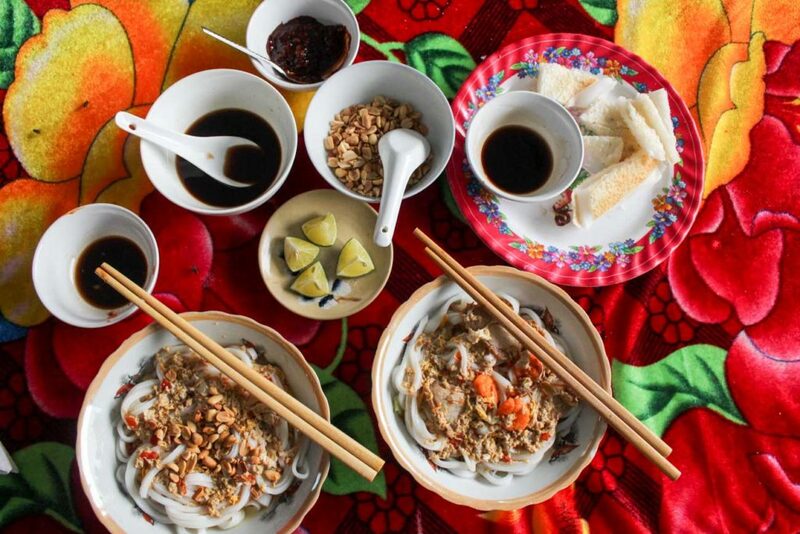 Time to learn how to prepare rice noodles, and eat them in a Hoi An style. 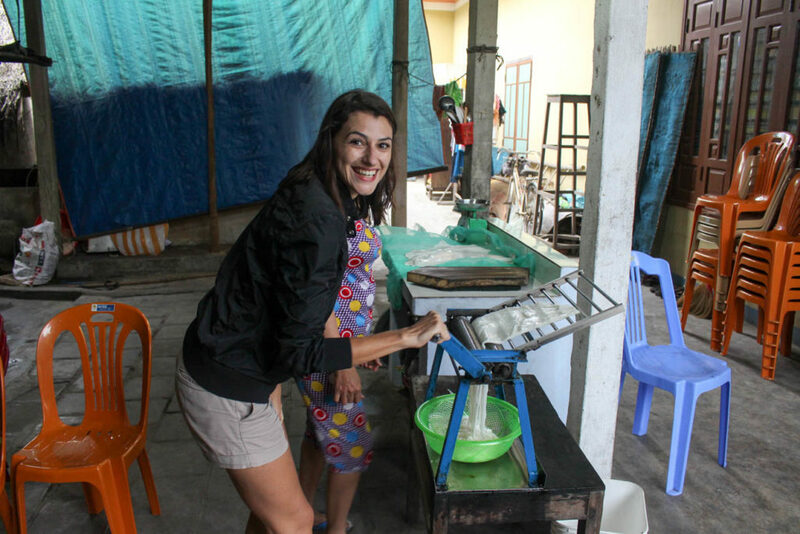 First she taught us to cook the rice dough and then how to cut them into flat silky noodles. It wasn’t too difficult, but by the laugh of the old man I’m sure we were doing it wrong… Well, we are better eating than cooking! So let’s eat! We tried Mì Quảng for the first time and we love it! The fresh noodle was mixed with mint leaves, broth, beans sprout, roasted peanuts and soft boiled eggs… Yummy!! We ate the whole bowl. The food was delicious, the talk and laughs around the dining table an experience we’ll remember forever. After the tour, Mì Quảng noodle became my favourite Vietnamese food. We jumped on the back of our vintage Vespa for more 30 minutes. On our way back to the old town we got a heavy traffic of motorbikes, bicycles and people. Kids leaving the school, adults going back home, and sunset lights changing the color of the sky. Hoi An countryside, you got me by heart and stomach. There are many motorbike tours in Hoi An, if you search online it will be hard to choose the best one. We choose the Hoi An Countryside Adventure by Vespa Tour because we want to have a unique experience with local people, and support the local business. As a travel blogger, we know how important is to help the locals to build a sustainable tourism. The Hoi An Vespa Tour was booked via Buffalo Tours, a renowned company that organizes tailor-made tours in Southeast Asia. If you like local experiences and memorable trips check the other tours we did with them: Trekking and Homestay at Sapa Mountains and Hanoi Like a Local in Vietnam, and Coffee Experience with Trekking in Chaing Mai, Thailand. When you book your tour be prepared to discover a new side of Hoi An, a different side of Vietnam. A beautiful and green country with delicious food and nice people. If your passion for rides and Vietnam is not satisfied yet, check this awesome post and be inspired to drive from Hoi An to Da Nang and Hue. The city is very touristic, especially the old town, so bear in mind you will need to pay to visit the tourist attractions in Hoi An. Buy the tourist pass, it gives access to 5 attractions, choose the best ones and save money. If you take photos of local people don’t be surprised if they ask for tips. If you feel hungry join a cooking class. Explore the island facing the old town and the night market they have there. Spending only one day in this cute city? Read this guide and make the most of your 24 hours in Hoi An. The easiest way is to fly to Da Nang and from there get a taxi or bus to Hoi An. If you love to travel by train, you need to drop at Da Nang Station and again from there make your way to Hoi An by bus or taxi. Da Nang is an interesting city.Reserve a day or two so you can check many things to do in Da Nang. Small homestay, big hotels and beach resorts, you can find all type of accommodation in Hoi An and around it. As we were there only for four days we choose to stay in the heart of the old town and no regrets. 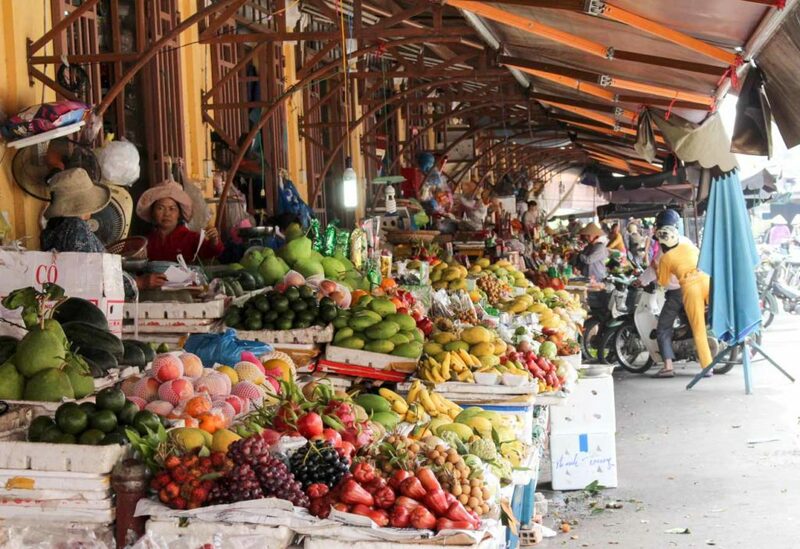 Easy to find good restaurants, markets and we visited all tourist attractions in Hoi An by foot or cycling. We recommend May Trang Homestay, a small hotel run by a Vietnamese family and it’s brand new. You get a comfy room, simple breakfast, wifi and free bicycles for a really good price. If we go back to Hoi An, we definitely stay there again. If you want something fancier or cheaper check the best prices and rates at Booking.com and Agoda. These are the best websites to search and book a hotel in Hoi An. If you want to a room by the beach here are some nice hotels and resorts at Hoi An seaside, only a few minutes driving from Hoi An old town. Go on a the Hoi An Vespa Tour, meet local people, try the delicious food and explore the beautiful rice fields. If you are planning to travel to Hoi An, don’t forget to read our post about how to get the Vietnam Visa Online and travel tips to Ho Chi Minh City, Hanoi and Sapa. You guys are too cute!!! <3 I loved Hoi An! Tom and I had our very first date there. The vespa tour looks awesome btw! We’re not fans of group tours either, so this sounds like the perfect way to explore. Not sure I’d be good at being a passenger, but I guess it’s probably a lot safer than driving vespas ourselves in Vietnam on those roads! Good tip about going with an empty stomach, always need to leave room if there’s pancakes involved! I was afraid to be a good passenger, but they drive so well and the landscape is so beautiful that after a few minutes I relaxed. Way better than drive your own motorbike, the roads in VItenam can be really tricky. I’ve never found the courage to drive a scooter in Asia, but It sounds like a great way to get to know the place and its people. Thanks for sharing the experience. Thanks for all the tips! What a lovely place and I love that they are all smiley and all. 😉 You two look great on the Vespa. It was a great way to connect with locals, and share some laughs with them! Vespa tour sounds like so much fun. I always rent a scootie myself when I am exploring SE Asia – its the best way to slow travel and see new places or just get lost (dont worry in se asia, you always find your way back lol). I sooo wanna try Mì Quảng – it looks like a mix of Indomie and Nasi Goreng. Yumm. We are a big fans o motorbike too! Nothing better that spending the day on a scooter exploring a new destination! And you are right, in Asia we always find our way back. And when we got lost, was the moment we discovered awesome things! Hoi An was in the middle fo our journey through Vietnam, and one of our favourite places! Vespa tours are a great way to sightsee, because you can cover so much ground in a day. No issues with parking either! Mì Quảng is delicious – I need some! What a great experience! I’m glad that you ride on the back, because I would be too nervous to do it myself. I also like they they keep it to local experiences, you can learn so much more that way about the culture. That looks like an amazing way to see Hoi An. I was pleased to hear you didn’t need to drive the Vespa, that would have freaked me. What a great food experience too! It was the best way to see Hoi An, such a unique afternoon!! Oh, What an interesting way to visit Hoi An. I think i should try that when i set my foot on Hoi An. But I’m not going to try that in Hanoi or Ho Chi Minh, I was amazed by the way the locals cross the road without any harms. It is an adventure to cross roads in Vietnam!